I finally filled a special request from Tia for a Blueberry Mallow Cheesecake -- which was just a slightly modified recipe of the Cranberry Mallow Cheesecake she ordered a little while back. 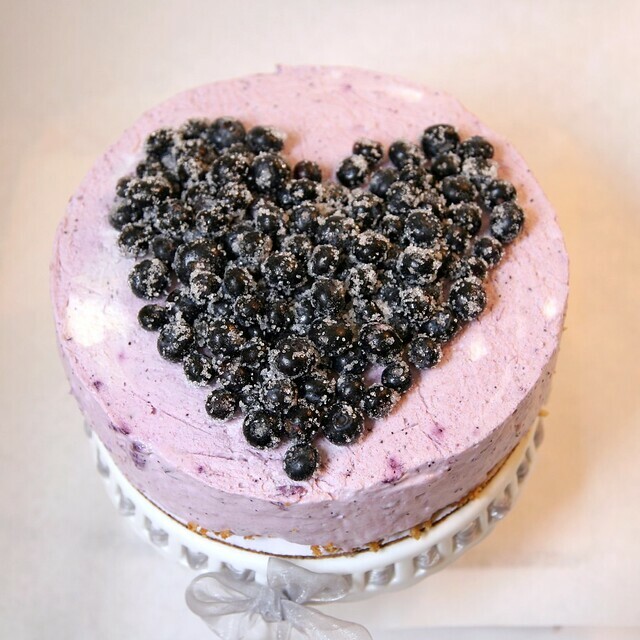 I decided to arrange the sparkling sugared blueberries in the shape of a heart on top of the cheesecake, just for fun. I followed these basic instructions for sparkling cranberries from 101 cookbooks (except using blueberries). Place blueberries in a medium glass bowl and set aside. To made simple syrup, bring water and sugar to a simmer in a medium saucepan over medium-low heat. Let the syrup cool for 5 to 10 minutes, then pour over blueberries. Cover and refrigerate overnight. The next day, drain the blueberries and toss them in sugar until well-coated. Place the coated blueberries on a baking sheet to dry for a few hours. Makes 2 cups of sparkling blueberries. To Assemble: Just before serving, carefully run a knife around edge of pan to loosen. Spoon sugared blueberries over cheesecake.